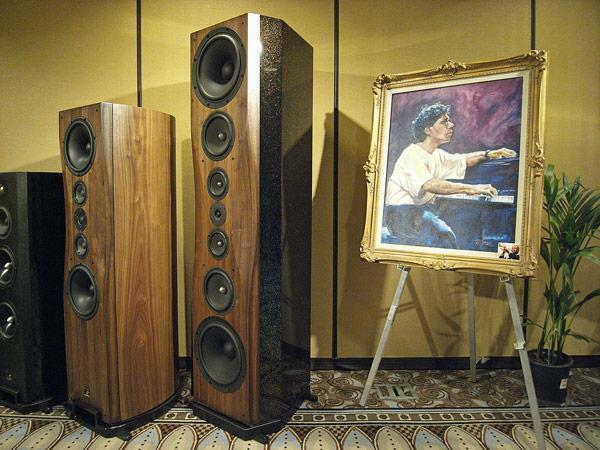 The Sonist Concerto 3 ($3495/pair) is a favorite of Art Dudley's, who praised its "SET-friendly" nature (April 2009). The system I heard in the Sonist room at T.H.E. Show used the Concerto 4 ($5895/pair), which JA wrote about in his report from the 2011 Atlanta Axpona, The Concerto 4 is claimed to have a sensitivity of 97dB, 2dB higher than the Concerto 3, and the bass is claimed to extend 3Hz lower, to 27Hz. (When it comes to the extremes of sensitivity and bass extension, even small gains are hard to come by.) With a Cary 306 Pro SACD/CD player as the source, Increcable Acoustic Lab TIA216 integrated amp (300B-based), Acoustic Revive power conditioner, and Exakte cables, the sound was clean, open, and "fast" on percussion. 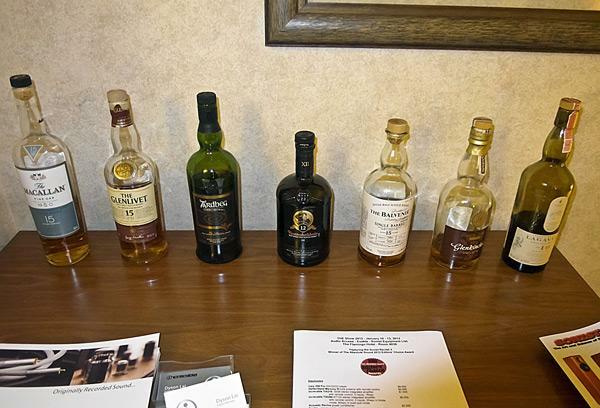 As well as providing a list of equipment in the demo system, Sonist’s Randy Bankert offered visitors a choice of libation. Thiel and Bryston always share an exhibit area in the Sands Convention Center’s Bassano Ballroom, and this year's CES was no exception. James Tanner, Bryston's upbeat product manager, had gathered a terrific playlist of musical selections on a thumb-drive, which drove the company's $2195 BDP-1 digital file transport, $2195 BDA-1 DAC. 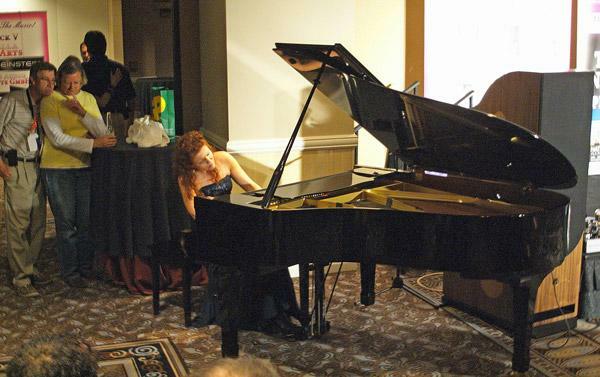 Livingston Taylor's whistling on "Isn't She Lovely" opened the playlist, just as it did at the Joseph Audio suite, and many othersit was a common selection at the Venetian exhibits. Sound from the $9500 Bryston SP-3 preamp/processor ($7900), three-channel Bryston 6BSST2 amplifier, Thiel CS1.7 speaker prototype and Thiel USS SmartSub Subwoofer produced soundstage depth and imaging that was among the best, almost as good I heard at the much more expensive system in the VTL suite. Tanner walked me through Bryston's newly announced BHA-1 headphone amplifier featured in the photo ($1295), which is highly versatile, including twin XLR outputs for balanced headphones, and both XLR and ¼ jacks for conventional headphones. 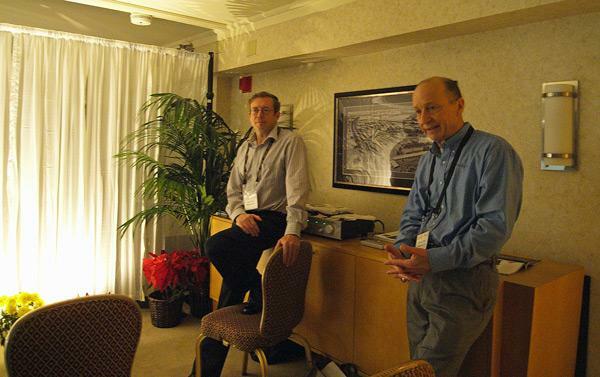 If the Lamm room in the Venetian with the Wilsons was one of the first I visited at CES, the last room I visited was Tempo Marketing's in the Mirage Penthouse. I reported last October that Tempo had taken over US distribution of this Scandinavian brand. 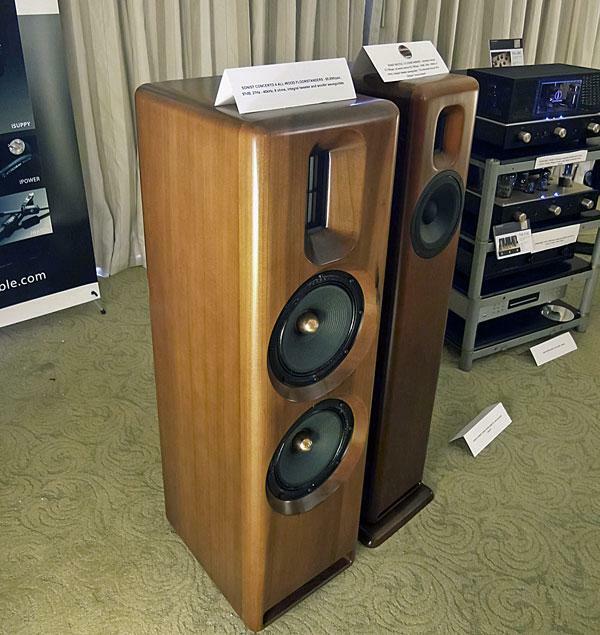 As well as the stand-mounted Cenya ($4000/pair), which I had heard at the 2011 RMAF, Tempo was demming the floorstanding, two-and-a-half-way Sara S ($7995/pair), shown in my photo. The Sara S combines two magnesium-cone SEAS mid-woofers with a SEAS tweeter in an enclosure that comprises a unique construction combining MDF and plywood. 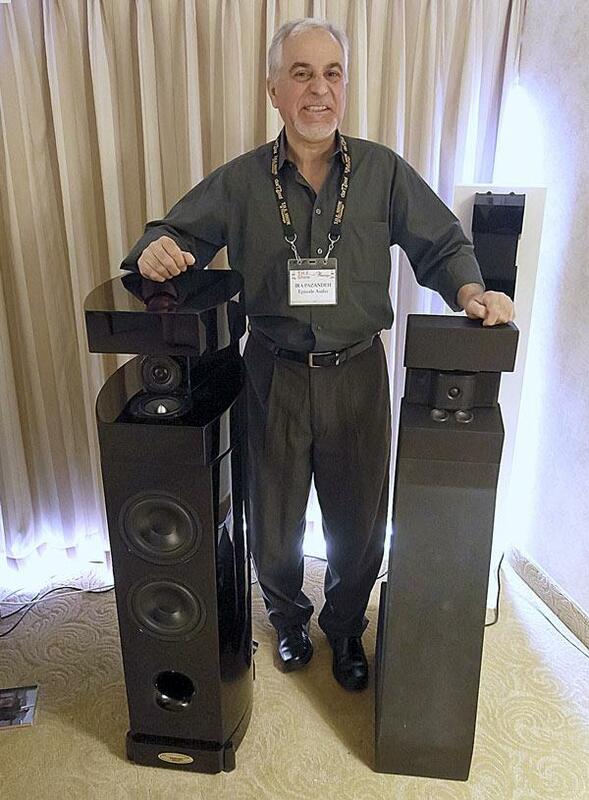 Robert Deutsch reported below on PBN's $14,999/pair Liberty speaker. My attention in the company's large room at T.,H.E. 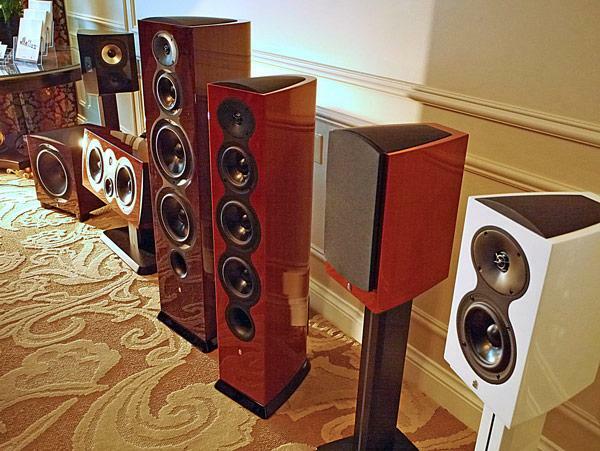 Show was attracted by the large WAS2 (right), which costs $55,000/pair, with its piano-black lacquer-finished enclosure and mahogany hardwood front baffle, and weighs 1000 lbs/pair. It combines two 15" subwoofers, driven by a 1kW ICE-Power amplifier, two 8" coated paper-cone woofers, two 5.25 Nextel-coated paper-cone midrange units, and a 1.1" soft-dome tweeter. Frequency response is quoted as 18Hz22kHz ±1.5dB and sensitivity is said to be 94dB! The great thing about audio shows is whom you bump into in the corridors. 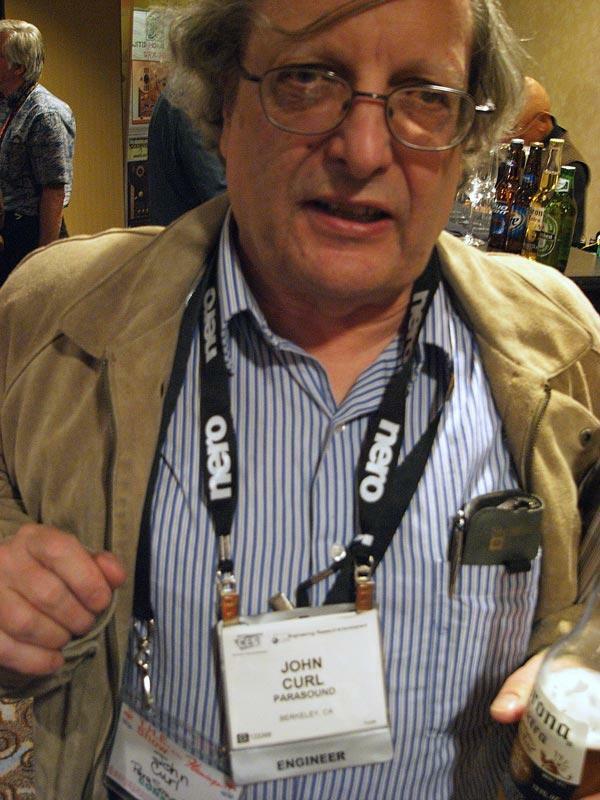 Here is legendary engineer John Curl, who has been designing the superb-sounding Halo series of amplification components for Parasounddig the name badge which, instead of the usual "Exhibitor," "Press," "Sales Representative," or "Consultant," simply and very appropriately says "Engineer." 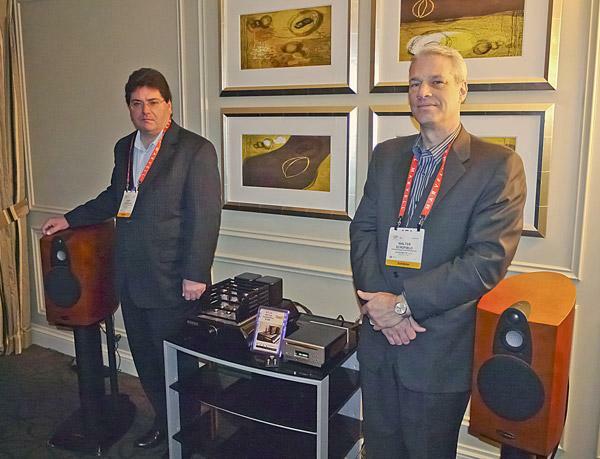 As they had at the 2011 Show, Magnepan's Mark Winey (left) and Wendell Diller (right) were demonstrating their system behind a curtain, so that listeners' preconceptions would not affect their opinions of the sound. 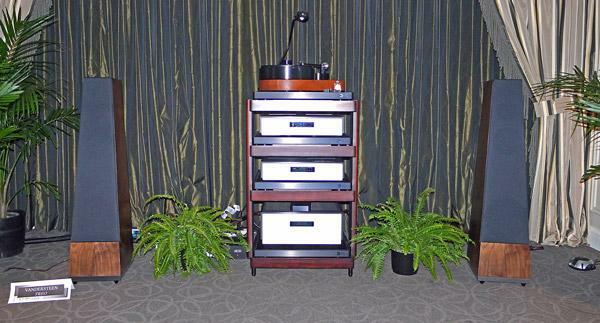 It turned out that the speakers being demmed, driven by Bryston amplification, were a pair of the Minnesotan company's MMG planars ($599/pair), to which had been added a $5000 Tricenter center channel speaker. This seemed a bit odd to me, but Wendell explained that they were showing an unlikely combination that might be just what a specific customer needed. Episode Audio, exhibiting at T.H.E. Show, had some unusual-looking speakers, with the tweeter set well back from the front of the speaker, presumably to effect time alignment. They also claim wide dispersion horizontally and vertically over a wide range. The Episode-V ($12,500/pair) sounded good despite having a less-than-audiophile-quality Sony DVD/CD player as the source, and modestly-priced Onkyo electronics. Wharfedale is one of those venerated British names in audio. And while its image is perhaps on the old-fashioned side, there's absolutely nothing old-fashioned about the latest Jade series of loudspeakersunless you're thinking of old-fashioned craftsmanship. The price of speakers in the Jade series ranges from $1200/pair (stand-mounted Jade-1) to $4200/pair (floorstanding Jade-7), and the manufacturing is vertically integrated: they make every component of each speaker! Revel's well-received Performa series of loudspeakers has been completely overhauled, with a number of advances in materials and manufacturing technologies. The new Performa3 series now consists of 10 models, including three floorstanders, two stand-mounted monitors, and various home theater speakers. The drivers are all new, and, according to Revel's Kevin Voecks, they have exceptionally low distortion, which contributes to clarity and transparency. This was very much in evidence with the pair of M106s ($1700/pair) and F308s (at $6000/pair, the most expensive speaker in this series) that I listened to. 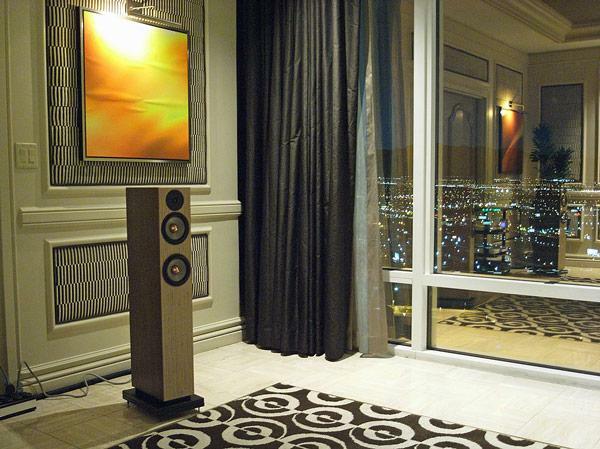 The Tréo ($5995/pair), shown in prototype form at the 2011 CES, is the latest speaker from Vandersteen. Indications are that it offers the same sort of musical accuracy that characterizes all of Richard Vandersteen's designs. It's a three-way design, with a 1" ceramic-coated alloy-dome tweeter, 4.5" tri-woven composite-cone midrange, 6.5" woven fiber-cone woofer, and an 8" subwoofer. 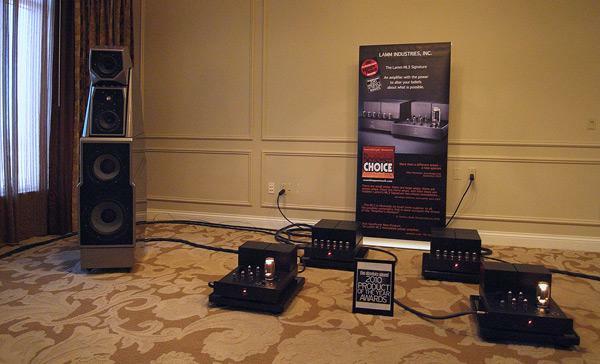 Like other Vandersteen speakers, the Treo is time and phase correct. Through the years, Vandersteen has moved away from the strictly functional appearance of the original model 2 and model 3, and the Treo is perhaps a culmination of this trend: the slim, truncated pyramid is stylish as well as functional. My notes on the makeup of the system playing are somewhat difficult to decipher (I need to take a course in remedial handwriting or start to carry an iPad with me), but I can tell you that it used Aesthetix electronics and a turntable source. The LP of Mary Black singing "Babes in the Wood" sounded smooth and engaging. 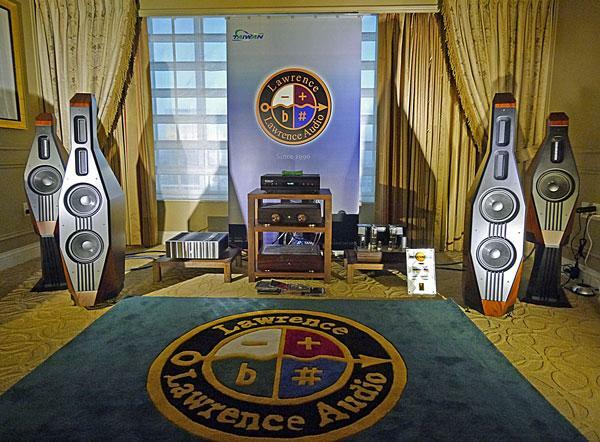 Taiwan-based Lawrence Audio has three speaker models: the Mandolin ($5500/pair), Violin ($7500/pair), and Cello ($19,000/pair). 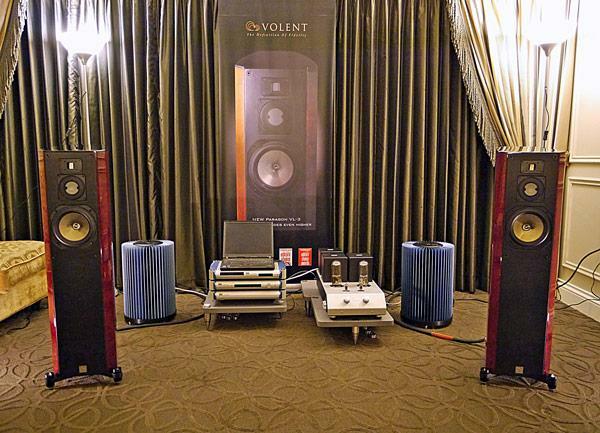 They're described as being "inspired by musical masters," and, come to think of it, all three speakers bear a resemblance to largish string instruments, with a "belly" that houses the woofer, and the part of the cabinet housing the midrange and tweeter look somewhat like the neck of a cello or string bass. The midrange driver and tweeter are once again based on the Heil design. The system I heard, featuring the Cellos, sounded very promising. In my posting on Opera Loudspeakers, I wrote about company names, and how they might suggest something about the product and the priorities of a speaker's designer. In the case of Volent Corporation, I must admit to being puzzled. What does this mean? The Dictionary of Difficult Words defines "volent" as "exercising will power." How does a speaker do that? Finally, going through the company's website, I found the following explanation: "the name Volent [is] derived from the phrase, 'Voice of Excellence': signifying not only the quality of reproduced sound but also the vocal appreciation of music lovers."